Having a check returned due to insufficient funds can be costly, inconvenient and embarrassing. At Infuze Credit Union, we always encourage you to manage your finances responsibly and never encourage overdrafts. However, we want to save you from the additional merchant fees and possible damage to your credit history that might result if a check is returned. That’s why we provide Courtesy Pay, a special overdraft service for Infuze Credit Union’s members. Courtesy Pay is a discretionary overdraft service requiring no action on your part that provides you a safety net up to an automatically assigned overdraft limit. Your Courtesy Pay limit may be available for checks and other transactions made using your checking account number or automatic bill payments and recurring debit card payments. Also, at your request, we may authorize and pay ATM transfers or withdrawals and everyday debit card purchases using your limit. Click Here to Download our Courtesy Pay Brochure. If you also want us to authorize and pay overdrafts on ATM and everyday debit card transactions, stop by a branch near you or contact our Member Support Center at 573.329.3151. Please take a moment to review the following Frequently Asked Questions below to learn more about Courtesy Pay and refer to the Courtesy Pay member policy for additional details. What if I go beyond my Courtesy Pay Limit? Overdraft above and beyond your established Courtesy Pay limit may result in checks or other items being returned to the payee. The returned item NSF fee of $29 will be charged per item and assessed to your account. An OD/NSF notice will be sent to notify you of items paid and/or returned. What does my Courtesy Pay cost? There is no additional cost associated with this privilege unless you use it. You will be charged our paid item NSF fee of $20 for each overdrawn item created by a traditional paper-check, a teller withdrawal, an automatic payment (ACH) transaction, or a recurring debit card payment. For business accounts, the limit may be available for ATM and everyday debit card transactions. Also, if you have requested us to do so, we may authorize and cover ATM transfers or withdrawals and affected by authorizations which could create additional overdrafts and associated fees. For example, three paid items in one day will result in $60 in paid item NSF fees. To help you manage your account, the total fees you have paid for items (both paid and returned) during the current month and for the year-to-date will be reflected on your monthly checking statement. What is my Courtesy Pay limit? If I have two checking accounts, can I get Courtesy Pay on both? Infuze Credit Union shall review Courtesy Pay eligibility and limits after the first 31 days once your account is opened, and will continue to review eligibility annually or as necessary. 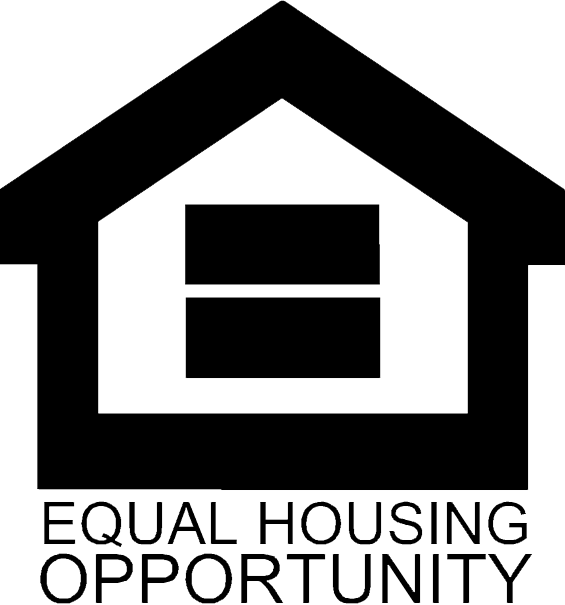 If you meet the eligibility criteria, a limit will be assigned as described below. However, if your account fails to meet the minimum eligibility requirement, we will continue to review your eligibility nightly after the first 31 days and will assign a limit once the requirements are met. We may limit the number of accounts eligible for Courtesy Pay to one account per household. You should make every attempt to bring your account to a positive end-of-day balance as soon as possible and must do so within 30 calendar days. If you are not able to do so, you will receive a letter from Infuze Credit Union informing you that your Courtesy Pay limit has been suspended and additional items will be returned. If your limit is suspended, unless we notify you otherwise or you request this service to be removed from your account, your limit will be made available to cover overdrafts again the first business day after you bring your account to a positive end-of-day balance. What are some of the ways I can access my Courtesy Pay limit? Will me limit be reflected in the balance I receive? The chart below shows the different ways you can access your Courtesy Pay limit and indicates whether or not this limit will be reflected in the balance provided. What if I am having trouble repaying my Courtesy Pay or use it frequently? Please contact us at 573.329.3151 if: (1) you do not believe you will be able to bring your account to a positive end-of-day balance within the required time period; (2) find that you are using Courtesy Pay more often than you intend; (3) don't understand why your account becomes overdrawn. We would like to discuss your situation with you. Following regulatory guidance, we will contact you if you are paying multiple NSF Fees (i.e., more than six fees in a rolling 12-month period), to discuss possible alternatives to Courtesy Pay that may better meet your short term credit needs. In the event you ask us to stop contacting you because you have determined Courtesy Pay is appropriate for your needs, we will honor your wishes. However, if we identify that the number and frequency of overdrafts increases materially for an extended period of time at some point after that, we may contact you again to ensure Courtesy Pay is still the most appropriate option available to you for covering your short-term credit needs. How do I know when I use the Courtesy Pay limit? Each time items are paid, including fees, you will see them reflected on your statement, when using mobile of online banking or by setting up and receiving account alerts. How soon can I use my Courtesy Pay? If you are a new member, we will advise you 30 or more days after your account is opened that you may use the overdraft privilege service. This is provided you have maintained satisfactory activity in the account, including regular deposits, consistent with our internal standards for new account types that may offer Courtesy Pay. Once you are notified your Courtesy Pay limit is available to you, it may continue to be available provided you maintain the account in "good standing" as defined in this brochure. What are some other ways I can cover overdrafts at Infuze Credit Union? The best way to avoid overdrafts and fees is to keep track of your account balance by entering all checks, debit card purchases and ATM withdrawals in your check register, reconcile your account regularly and manage your finances responsibly. However, if a mistake occurs, Infuze Credit Union offers additional ways to cover overdrafts in addition to Courtesy Pay. What if I do not want to have Courtesy Pay on my account? If you would like to have this service removed from your account, please call 573.329.3151. There are several ways your account can become overdrawn, such as (1) the payment of checks, electronic funds transfers or other withdrawal requests; (2) payments authorized by you (i.e. signature-based point of sale transactions); (3) the return of unpaid items deposited by you; (4) credit union service charges; or (5) the deposit of items which, according to the credit union’s Funds Availability Policy, are treated as not yet available or finally paid. While we are not obligated to pay any item presented for payment if your account does not contain enough money, as long as you maintain your account in “good standing,” we may approve your overdraft items within your current available Courtesy Pay limit as a non-contractual courtesy. For Courtesy Pay consideration, your account is in “good standing” if you (1) deposit enough money to bring your account to a positive end-of-day balance at least once every 30 calendar days (including the payment of all credit union fees and charges); (2) avoid excessive overdrafts suggesting the use of Courtesy Pay as a continuing line of credit; and (3) have no legal orders, levies or liens against your account. In the normal course of business, we generally pay electronic transactions first and then checks in serial number order, per the credit union’s policy. We reserve the right to change the order of payment without notice to you if we suspect fraud or possible illegal activity affecting your account. Also, please be aware that the order we pay your items in may create multiple overdraft items in a single day and you will be charged our paid item NSF fee of $20 for each overdraft item paid. You may opt out of the privilege at any time, but you are responsible for any overdrawn balances at the time of opting out. Normally, we will not approve an overdraft for you in excess of the predetermined amount assigned to your account type. So as not to exceed your limit, please note that the amount of the overdraft plus the credit union’s paid item NSF fee of $20 per item will be deducted from the Courtesy Pay limit. We may refuse to pay an overdraft item at any time even though we may have previously paid overdrafts for you. For example, we typically do not pay overdraft items if your account is not in good standing as defined above, or, if based upon our review of your account management, we determine that you are using Courtesy Pay excessively or seem to be using Courtesy Pay as a regular line of credit. You will be charged a returned item NSF fee of $29 for each item returned. We will notify you promptly of any non-sufficient funds items paid or returned that you may have; however, we have no obligation to notify you before we pay or return any item. The amount of any overdraft including our paid item NSF fee of $20 and/or a returned item NSF fee of $29 that you owe us is due and payable upon demand. Even if we do not ask you for payment, you must repay us, no later than 30 calendar days after the creation of the overdraft. If there is an overdraft on an account with more than one owner on the signature card, each owner and agent, if applicable, is jointly and severally liable for all overdrafts including all fees charged. Courtesy Pay should not be viewed as an encouragement to overdraw your account. To avoid fees, we encourage you to keep track of your account balance by entering all items in your check register, reconcile your checkbook regularly, and manage your finances responsibly. If you would like to have this service removed from your account, please call 573.329.3151. 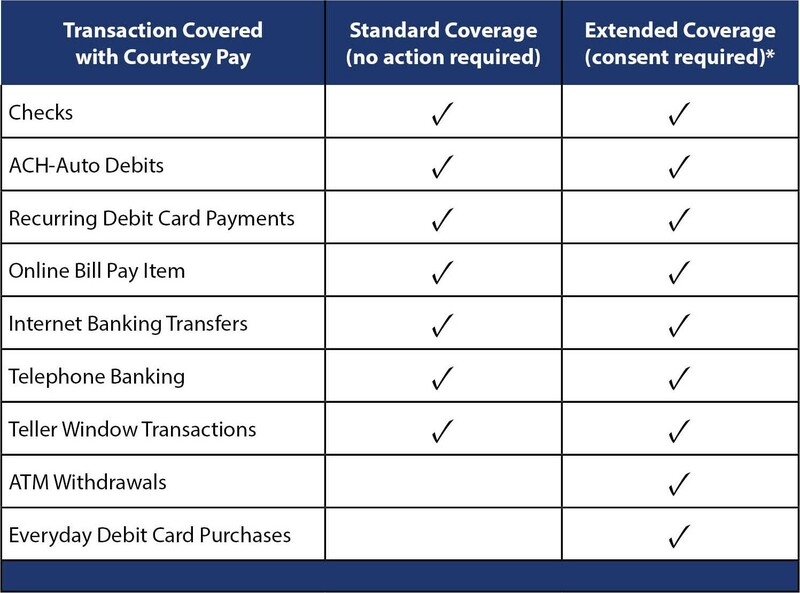 Please note that your Courtesy Pay limit may be available for each item paid under the limit created by checks and other transactions made using your checking account number, such as a teller withdrawal, an automatic payment (ACH) transaction, or automatic bill payment and recurring debit card payment. For business accounts, the limit may be available for ATM and everyday debit card transactions. Also, at your request, we may authorize and pay ATM transfers or withdrawals and everyday debit card purchases using your limit. Your available balance may be affected by authorizations that could create additional overdrafts and associated fees. When you ask for your account balance, please remember the amount we show you does not include your overdraft limit.